Recent research has worked under the assumption that at least a part of the phenomena symptomatic of schizophrenia has to do with the dysfunctional processing of context information (cf. Chapman/Chapman/Miller 1964, Cohen/Camhi 1967, Poljakov 1974, Chapman/Chapman/Daut 1976, Manschreck et al. 1988, Emrich 1989, Cutting/Murphy 1990, Emrich 1992, Cohen/Servan-Schreiber 1992, Schecker 1993, Maher/Spitzer 1993 and Spitzer 1994, among others). Decke) and the beginning of the target (for instance, the beginning of Bett) has to be included as well; this discrepancy is called the inter-stimulus interval, or ISI (data in Swinney 1984). For schizophrenic patients as well as healthy control subjects, such priming influences the ensuing decision time (this is what we call the "priming effect") for both of the two most common meanings of Decke - ceiling (of a room) and blanket/covers (on a bed) - at an ISI of up to 1,000 msec; in other words, for both schizophrenic patients and healthy control subjects the target Wand [wall] as well as the target Bett can be primed under ISI=1.000 msec. If the ISI goes above 1.000 msec, healthy speakers only produce a priming effect for the context-adequate meaning: here, the target Bett. The schizophrenic patients, however, continue to produce responses for the target Wand at ISI>1,000 msec. In other words, non-context-adequate meanings are not ruled out; there is no monosemanation of ambiguous word forms. Peters speaks here of concretism; one could reinterpret his observations (see Schecker et al. 1998 for more on this) without contradicting his analysis to claim that the patient in question is not capable of abstracting her husband's intended meaning (something like a compliment and/or an expression of joy) from the literal meaning and the situational context. Nevertheless, the patient does understand the literal meaning of her husband's utterance, so that a deficiency in imagination and the processing of the relevant situational context must (again!) be assumed. What happens when you go to a restaurant? The answers to such test questions differed from those by healthy speakers in few (but admittedly interesting) respects; over all, the answers of the patients only allow the conclusion that the patients possess the general knowledge typical of people with their level of education at the same age. However, if the patients are presented with highly conventionalized conversational fragments (printed on an index card) like Zahlen bitte! [Check please] and asked to combine them with other cards to form common communicative sequences, the patients prove to be dramatically less capable of carrying out these instructions than the healthy control subjects. Results of this kind prove that there is no amnesia for knowledge of holistic (common) conversational contexts, but rather that certain selection and integration processes in the interplay between general context patterns and individual data ( = context monitoring) must be dysfunctional. The research by the Cohen group (some seven articles; see Cohen & Camhi 1967) has gotten somewhat lost in the European shuffle on language processing among schizophrenics. Their findings, however, shed much light on our discussion. Cohen et al. divided schizophrenics and healthy subjects into groups of listeners and speakers. The speakers were shown word pairs in which one word was marked: *Sonne/Rose [sun/rose]. Their task, then, was to find a key word that enabled the listener, who had not seen the marked word, to come up with the correct word. Here, the schizophrenics were dramatically more unsuccessful as speakers than healthy subjects, though they did not differ significantly as listeners. Cohen et al. saw the results as proof of failed integration planning of the steps in a two-level model. They assume that schizophrenics as speakers--and the same goes for healthy subjects as well--call up various possibilities for each word of the pair they are shown, though the context inadequate entries thus called up are "less likely to be edited out" by them than by healthy subjects. Here, the exclamation points indicate predicate adjectives that fit the one or the other, not both. What were Cohen's patients not able to do? In the speaker role, context determination and rejection of inadequate lexical entries were called on simultaneously and mutually related to one another (context dependent on the given selection; selection dependent on the given context); obviously, this interplay was dysfunctional. Nonetheless, the two processes - context determination and entry rejection - seem to function properly on their own. If we assume, then, that the syntagmatic context represents a verbal context for a paradigmatic selection process - in other words, that the interplay between the determination of syntagmatic boundaries and paradigmatic selection and rejection is a special case of interplay between holistic context patterns (integration) and individual pieces of information (selection) - then the processes of context monitoring were dysfunctional among Cohen's patients. The interplay between syntagmatic context and paradigmatic selection has consistently been described with the term selection restriction (SR) in modern linguistics: a given syntagmatic context means certain restrictive selections for an ensuing paradigmatic selection process. N.b. : in contrast to its use in structuralist linguistics, "selective restrictions" is used here to mean focussing processes of context-driven selections from paradigms. Verbs like schwimmen are problematic insofar as a change of case is possible and, furthermore, even bears a difference in meaning; the accusative is directional, the dative locational. Here, we are dealing with a methodically inseparable mixture of morphosyntactic and semantic contexts and the resulting selection restrictions. The asphalt has passed away. If we can confirm the breach of semantic contexts and the resulting selection restrictions for such utterances, then the same goes for our categorical knowledge of the world; our purely linguistic knowledge of the meaning of utterances overlaps with our general world knowledge. The housewife massaged the dough. Dough is kneaded, not massaged--though this has nothing to do with the activity itself and everything to do with the conventional term we give to it (interestingly, a masseur can "knead"). Thus, our knowledge of linguistic relations, not our general knowledge, is called upon. The retired woman defeated the professional boxer. The sun is white (see above). Our knowledge of linguistic codes is not at fault here. We can, for the time being, work under the assumption that here, too, we are dealing with holistic (stereotypical) contexts, allowing us to speak of selection restrictions for these examples as well - or, to be more specific, pragmatic selection restrictions. The priming tests described earlier suggest that schizophrenic patients have difficulties with verbal contexts as well as situational, conversational ones. The Cohen tests even seem to suggest more specifically that context monitoring is dysfunctional. Neither these priming tests nor the Cohen tests make any distinction between the meaning of utterances (semantics) and general knowledge (pragmatics). Why, for instance, am I not able to cuddle up under a table cloth (Tischdecke)? 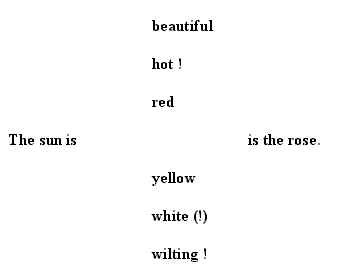 Is it really only a matter of semantics that a rose cannot be hot, that the sun is not white (see above)? Are these really just verbal mistakes? But even if one holds to the assumption that context-monitoring processes are dysfunctional, it is not clear which of the difficulties described are due to semantic context determination and the resulting selection restrictions and which result from pragmatic selection restrictions. And finally, to what extent does morphosyntax play a role? We took a closer look at these questions in a series of reproduction experiments . Our findings allowed for relatively broad-reaching conclusions that, admittedly, need to be investigated further. 15 right-handed, German-speaking schizophrenic patients between the ages of 23 and 35 took part in the experiments (average age 25.2; 6 males and 9 females). All of the patients were diagnosed as hallucinatory-paranoid. The beginning of the illness was between three and five years earlier. All the patients were on medication and had regular "chores" to do as part of their stay in the hospital. The control group of healthy speakers was accordingly comprised of right-handed, German-speakers (average age 23.6; 48 females and 29 males). Further common aspects included the noun subject as a title of a profession or social status and, in the sentences with incorrect semantic or morphosyntactic selection restrictions, the predicate (finite verb + objective case noun phrase) as an activity associated with the former--activities that had been previously judged by several test-takers as only probable. The sentences were in Times Roman font on white paper and photographed on slides as large as the slide format would allow. A slide with normal text graphics was then projected, followed by the beep to indicate the beginning of the tachistoscopical presentation of the sentences, which were more or less randomly ordered. Between sentences there was a pause of one second for both groups. Immediately after seeing the sentences, the subjects were told to open an envelope that had been given to them previously. Inside the envelope was a questionnaire on which all the sentences were listed in a different random order. In the place of the final word (the object noun), there was a fourteen-space blank followed by a period. The final word (the object noun) of the original set was always a compound word; we hoped to limit the number of chance correct answers this way, as well as make gradual recall of the thought process possible. The written instructions were to fill in the blank with the missing words as accurately as possible. The subjects were given six minutes to complete both parts of the test. We carried out a strict analysis (only type A counts as correct) and a lenient one (A through D are correct). However, neither the correlation of individual sentence types nor the two exposure times of three and eight seconds showed significant changes for the correlations of the variables controlled for. Therefore, in the following we will concentrate--with a few exceptions--on the strict analysis (only type A is correct). Statistically, we carried out a 2 x 2 x 4 variance analysis with the factors A = group, B = exposure time and measurement repetition factor, and C = sentence type (for details, see Bortz 1984). In the case of significant differences in the mean, the overall design was divided into variance-analytical categories for two sentence types as subsequent tests. The margin of error for the variance analyses was kept conservative, following the example of Greenhaus and Geisser (cf. Winer 1971); we did without the margin of error determined by repeated measurements for the determination of significance. An alpha-adjustment for the prevention of significance inflation was also not used. All of the following findings are significant, if not highly so; whenever this is not the case, mention will be made of the fact. The first significant difference was the group effect common among schizophrenic patients: a generally significantly reduced performance (F (1.36) = 20.8 / p < .001). Further, we find a general effect of sentence type (F (3.108) = 30,6 / p < .001): sentences with damaged pragmatic selection restrictions ( = SRs) were reproduced for all groups and exposure times most successfully, sentences with damaged morphosyntactic SRs least successfully. Finally, there was an interaction between group and sentence type (F (3.108) = 12.8 / p < .001): healthy subjects reproduced sentences with damaged morphosyntactic SRs least successfully; schizophrenic patients had difficulty reproducing both types of sentences. Here, there seems to be an effect of exposure time as well since, in addition to the interaction of group and sentence type, there was also a significant interaction between exposure time and sentence type (F (3.108) = 4.1 / p < .01): regardless of group (healthy control group vs. schizophrenic patients), sentences with damaged morphosyntactic SRs were reproduced equally poorly in both exposure times. for all sentence types, the longer exposure time improved the subject's ability to reproduce a sentence. The triple interaction of exposure time + group + sentence type was - as one would expect - not significant. The two double interactions are difficult to interpret in detail. Thus, we have divided the 2 x 2 x 4 variance analysis (the "large VA") into two 2 x 4 VAs, divided for both groups. For the control group, only the sentence type has a significant influence on their ability to reproduce sentences correctly (F (5.54) = 40.2 / p < .001). The differences in the means scores that appear on the chart--differences due to the variation of the exposure time--are not significant; the same goes for the interaction between the two factors. For the schizophrenic patients, the variable "sentence type" led to significant differences in the mean scores (F (3.54) = 3.5 / p < .05): sentences with damaged pragmatic SRs were recalled better than, for instance, sentences with damaged semantic SRs. The interplay between sentence type and exposure time also reached a significant level for the schizophrenic patients (F (3.54) = 3.9 / p .05): for control sentences, sentences with damaged semantic SRs, and sentences with damaged pragmatic SRs, the longer exposure time led to significantly better recall; for sentences with damaged morphosyntactic SRs, the longer exposure time led to significantly worse recall. In the following, we will only discuss those findings which appear most important to us. We will, however, attempt to place this discussion in a larger argumentative context. The schizophrenic patients are generally less successful in their recall ability than healthy subjects, as we have already stated; we will come back to this shortly. If we take this into account and compare only the recall performances within-group, it becomes clear that schizophrenics remembered sentences with damaged semantic SRs significantly worse after the three second exposure than (a) control sentences, (b) sentences with damaged morphosyntactic SRs, and (c) sentences with damaged pragmatic SRs. Only after the eight second exposure did they approach the performance levels for the other sentence types. One could interpret the lack of a significant effect of damaged SRs on healthy subjects for both times to mean that these subjects have at their disposal "area-specific" compensatory mechanisms (see below for more on this)--or, to quote Bühler, "apperceptive correction processes." Damaged semantic SRs are a common, highly conventionalized means of creating metaphors. In certain contexts, one almost expects the semantic SRs to be broken. This means, however, that a plethora of simultaneously "down-loaded" reinterpretation possibilities for the sentence context must be sorted through. If we do not want to assume that there are far-reaching functional (and structural?) differences between the comprehension processes of healthy subjects and those of schizophrenic patients, it is not clear why the apperceptive correction processes of schizophrenic patients do not come into play immediately (see below for more on this). We say "immediately" as the schizophrenic patients make up for much of their inability when they have an eight second exposure time and a correspondingly longer processing time. We interpret the obviously longer time needed by schizophrenic patients as the time needed to "switch gears" into the mode of so-called controlled information processing. According to this model, such corrective processes are at the disposal of healthy speakers in highly routine, automatic information processing. The "auto-pilot" of the processing of selection restrictions, then, might be dysfunctional in some way among schizophrenic patients. If we go back again to the generally reduced performances of the schizophrenic patients, we see that their massive performance drop-off results from the reproduction of sentences with damaged semantic SRs as a combination of a general deficiency with a specific one. The damaging of morphosyntactic SRs leads to a significant break in the reproduction performance of healthy speakers for both exposure times. In comparison to the reproduction of damaged semantic SRs, this seems to suggest that there are no area-specific possibilities for corrections--neither automatically nor consciously . The difference between the two exposure times is not significant. The break-down in performance among healthy speakers, then, does not necessarily have to do with any lack of information. Rather, the store of patterned morphosyntactic frames seems to be linked to inhibitory mechanisms; if morphosyntactic SRs are damaged, the result is--at least tendentially--an interruption in the continuance of the processing of information (or, to put is more clearly, the comprehension strategy is switched--see below for more on this). Moreover, these findings seem to us to be interpretable to the extent that we must assume autonomous morphosyntactic processing in language processing. In addition, such receptive morphosyntactic processing seems to take a certain priority over semantic and, hence, also pragmatic processing (see below): sentences with damaged morphosyntactic SRs were remembered less successfully than all other sentence types by healthy speakers. For schizophrenic patients, the damaging of morphosyntactic SRs--as opposed to the damaging of control sentences--did not lead to a break-down in performance. This could mean that corresponding inhibitory mechanisms that lead to interruptions in comprehension among healthy speakers (i.e. switches in comprehension strategies) are dysfunctional among schizophrenics. Normally the longer exposure time improved the level of reproduction, especially for schizophrenic patients. But what are we then to make of the significantly worse results produced by schizophrenics after the eight second exposure to sentences with damaged morphosyntactic SRs? We have no answer to this question except that schizophrenics might possibly be trying to carry on with conscious information processing even in such cases as these, where no area-specific correction possibilities exist. The result is a sort of overload and its concomitantly poor performance levels. The reproduction performances for both healthy subjects and schizophrenic patients--regardless of the exposure time--went up when pragmatic SRs were damaged. This speaks against the theory of damaged selection restrictions, which must be revised. We assume, instead, that further processing channels are activated which lead to a rapid rise in the general activation level (as presumedly guided by the formatio reticularis on the basis of environment-input (Schmidt et al. 1983, Kolb and Whishaw 1993)). Do schizophrenics (also) have a speech deficit? Are their verbal context-monitoring processes dysfunctional? We hold that the clearly altered reproduction behavior of schizophrenics makes it clear that this is so. This argument centers around the fact that damaged morphosyntactic SRs lead to a sort of inhibition of the further comprehension process among healthy speakers. The raised frequency of null responses ( = answer type F) at the three second exposure also speaks for this hypothesis. Admittedly, the process of comprehension does not seem to be interrupted as the high frequency of null responses is replaced by an extraordinarily high number of vague paraphrases and confabulations ( = answer type E) during the change to the eight second exposure. Here, no null responses were found, which seems to indicate that a change to a purely semantic-contextual comprehension strategy, which no longer admits adequately exact reproductions, has taken place. According to the above, an inhibitory morphosyntactic control mechanism would be dysfunctional among schizophrenic patients, whereas it would lead--for reasons already discussed--to a change in comprehension strategies among healthy speakers. If it is true that the effect of damaged semantic SRs is automatically (three second exposure) compensated for among healthy speakers by means of apperceptive correction processes, then the question is why such an (automatic) compensation does not work for schizophrenic patients. To begin with, one would expect healthy subjects to produce inhibitory functions similar to those during the processing of sentences with damaged morphosyntactic SRs whenever compensation fails during the three second exposure. Schizophrenic patients, on the other hand, would be expected fail to produce a corresponding inhibitory effect in the processing of damaged morphosyntactic SRs. Thus, this cannot be the reason why the schizophrenic patients produced such drastically poorer responses in the three second exposure. We argued with respect to the healthy subjects that damaged semantic SRs signify metaphoric language use; healthy subjects process sentences with damaged semantic SRs as figurative speech. A number of studies on the comprehension of figurative as well as indirect utterances have shown that here, again, the context is decisive (cf. Schecker in this volume): only reference to the the whole context makes it clear whether an utterance is meant figuratively or indirectly and how it is thus meant. This very reference to context, however, is what is lacking among schizophrenics. This argument is also supported by the fact that schizophrenic patients do not produce null responses frequently when (poorly) reproducing sentences with damaged semantic SRs at the three second exposure (cf. the high frequency of null responses produced by healthy speakers during the processing of sentences with damaged morphosyntactic SRs). The poor reproduction of sentences with damaged semantic SRs--of the kind we observed with the schizophrenic patients--does not result in a break-down in comprehension, but rather essentially in more frequent confabulations (sentence type E). In our opinion, we have to take three kinds of comprehension "routes" into account for the comprehension of linguistic utterances. To begin with, there may be a direct decoding that is blocked among healthy speakers when processing sentences with damaged morphosyntactic SRs. Second, there may be area-specific, apperceptive correctional routines (i.e., in automatic information processing). Last, if the other two do not apply, we have a case of a purely sematic-contextually oriented comprehension strategy (i.e., conscious information processing). Assad, J.A. and Maunsell, J.H.R. 1995. Neuronal correlates of inferred motion in primate posterior parietal cortex. In: Nature Vo. 373 (9. Febr. 1995), 518 - 521. Bayer, J., de Bleser, R. and Dronsek, C. 1987. Form und Funktion von Kasus bei Agrammatismus. In: Linguistische Berichte - Sonderheft 1, 81 - 117. Bierwisch, M. 1970. Fehler-Linguistik. In: Linguistic inquiry 1, 397 - 414. Bleuler, E. 1911. Dementia Praecox oder die Gruppe der Schizophrenien. Leipzig / Wien. Bock, J.K. 1987. An effect of the accessibility of word forms on sentence structures. In: Journal of memory and language 26 (2), 119 - 137. Bortz, J.. 1989. Statistik. 3. Aufl. Berlin u.a. .
Chaika, E. 1974. A linguist looks at "schizophrenic" language. In: Brain and language 1, 257 - 276. Chaika, E. 1977. Schizophrenic speech, slips of the tongue and jargon-aphasia: A reply to Fromkin and to Lecours and Vanier-Clément. In: Brain and language 4, 464 - 475. Chapman / Chapman / Miller. 1964. A theory of verbal behavior in schizophrenia. In: Maher, B.A. (Hg.). 1964. Progress in experimental personality research. Vol. 1, New York / London. 35 - 167. Chapman / Chapman. 1973. Disordered thought in schizophrenia. New York. Chapman/ Chapman / Daut. 1976. Schizophrenic inability to disattend from strong aspects of meaning. In: Journal of abnormal psychology 85/1, 35 - 40. Cohen / Camhi. 1967. Schizophrenic performance in a word-communication task. In: Journal of abnormal psychology 72, 240 - 246. Cohen / Servan-Schreiber. 1992. Context, cortex and dopamine: A connectionist approach to behavior and biology in schizophrenia. In: Psychological Review 12, 45 - 77. Conrad, K. 1992. Die beginnende Schizophrenie. 6. Aufl. Stuttgart / New York. Coseriu, E.. 1967. Lexikalische Solidaritäten. In: Poetica 1, 293 - 303. Cramer, P. 1968. Word association. New York / London. Critschley, M.. 1964. The neurology of psychotic speech. In: British journal of psychiatry 110, 353 - 364. Cutting / Murphy. 1990. Preference for denotative as opposed to connotative meanings in schizophrenics. In: Brain and language 39, 459 - 468. Dell, G. 1988. The retrieval of phonological forms in production: Tests of predictions from a connectionist model. In: Journal of memory and language 27, 124 - 142. Dell, G. and Reich, P.A. 1981. Stages in sentence production: Analysis of speech error data. In: Journal of verbal learning and verbal behavior 20, 611 - 621. Dittmann, J., Fehrenbach, R.A. and Welsh, C. 1989. Morphosyntaktische Abweichungen bei Schizophrenie. In: Neurolinguistik 3/2, 145 - 173. Ellis, A.W. 1985. The produktion of spoken words: A cognitive neuropsychological perspective. In: Ders. (Hg.). Progress in the psychology of language. Vol. 2, London. Emrich, H. M.. 1989. A three-component-system hypothesis of psychosis - Impairment of binocular depth inversion as an indicator of a functional dysequilibrium. In: British journal of psychiatry 155, 37 - 39. Emrich, H. M.. 1991. Systems theory of psychosis: "Filtering", comparison, error correction and its defects. In: Emrich / Wiegand (Hg.). 1991. Integrative biological psychiatry. Berlin (Springer). Flores dArcais, G.. 1986. Konzeptuelle Strukturen und das mentale Lexikon. In: Bosshardt, H.-G. (Hg.). 1986. Perspektiven auf Sprache. Berlin/New York. 130 - 148. Friederici, A. 1984. Neuropsychologie der Sprache. Stuttgart u.a..
Friederici, A. and Levelt, W.J.M. 1988. Sprache. In: Immelmann / Scherer / Vogel / Schmoeck (Hgs.). Psycho-Biologie. Osnabrück. Fromkin, V.A. 1975. A linguist looks at "A linguist looks at 'schizophrenic' language". In: Brain and language 2, 498 - 503. Fry, D. 1969. The linguistic evidence of speech errors. In: BRNO studies of english 8, 69 - 74. Garrett, M.F. 1976. Syntactic processes in sentence production. In: Wales, R.J. / Walker, E. (Hgs.). New approaches to language mechanisms. Amsterdam. Garrett. M.F. 1989. Sentence processing. In: Osherson, D. (Hg.). Invitation to cognitive science. Cambridge / Mass..
Heeschen, C. 1985. Agrammatism versus paragrammatism: A fictitious opposition. In: Kean, M.L. (Hg.). Agrammatism. New York. Hoffman, R.E. 1993. Linguistic aspects of language behavior in schizophrenia. In: Blanken, G. u.a. (Hgs. ), Linguistic disorders and pathologies, Berlin / New York, 534 - 543. Hoffman, R.E. and Sledge, W. 1984. A microgenetic model of paragrammatisms produced by a schizophrenic speaker. In: Brain and language 21, 147 - 173. Hoffman, R.E. and Sledge, M. 1988. An analysis of grammatical deviance occurring in spontaneous schizophrenic speech. In: Journal of Neurolinguistics 3, 89 - 101. Jackson, J.H. 1931/32. Selected writings. 2 Bde. London. Käsermann, M.L. 1988. Schizophrenie: Zwei Umgangsweisen mit einer Beschreibung des Wahnsinns. In: Zeitschrift für Literaturwissenschaft und Linguistik (LiLi) 69, 21 - 40. Kempen, G. and Hoenkamp E. 1982. Incremental sentence generation: Implications for the structure of a syntactic processor. In: Horecky, J. (Hg.). Proceedings of the ninth international conference on computational linguistics. Amsterdam. Kempen, G. and Hoenkamp, E 1987. An incremental procedural grammar for sentence formulation. In: Cognitive science 11, 201 - 258. Klix, F.. 1988. Gedächtnis und Wissen. In: Mandl / Spada (Hgs.). 1988. Wissenspsychologie, München. 19 - 54. Kolb, B. and Whishaw, I.Q. 1993. Neuropsychologie. Heidelberg u.a. .
Kolk, H.J. and van Grunsven, M. 1985. Agrammatism as a variable phenomenon In: Cognitive Neuropsychology 2, 347 - 384. Kraepelin, E. 1913. Psychiatrie. 8. Auflage, Bd. 3, Teil 2, Leipzig. Lecours, A.R.1982. Schizophasie. In: The behavioral and brain sciences 5, 605 ff. Lecours, A.R. 1993. Glossomania and glossolalia in schizophasia and their linguistic kinships to the jargonaphasias. In: Blanken, G. u.a. (Hgs. ), Linguistic disorders and pathologies, Berlin / New York, 543 - 549. Lecours, A.R. and Vanier-Clément, M. 1976. Schizophasia and Jargon-aphasia. A comparative description with comments on Chaika's and Fromkin's respective looks at "schizophrenic" language. In: Brain and Language 3, 516 - 565. Leuninger, H.. 1986. Mentales Lexikon, Basiskonzepte, Wahrnehmungsalternativen. In: Linguistische Berichte (LB) 103, 224 - 251. Levelt, W.J.M. 1989. Speaking - From intention to articulation. Caambridge/Mass. Levelt, W.J.M. 1991. The architecture of normal spoken language use. In: Blanken u.a. (Hgs.). Linguistic disorders and pathologies. Berlin / New York 1993, 1 - 15. Maher, B.A. and Spitzer, M. 1993. Thought disorders and language behavior in schizophrenia. In: Blanken, G. u.a. (Hgs. ), Linguistic disorders and pathologies, Berlin / New York, 522 - 533. Manschreck, T.C., Maher, B.A., Milavetz, J.J., Ames, D., Weisstein, C.C. and Schneyder, M.L. 1988. Semantic priming in thought disordered schizophrenic patients. In: Schizophrenia Research 1, 61 - 66. Marshall, J.C. and Halligan, P.W. 1995. Seeing the forest but only half of the trees? In: Nature Vol. 373 (9. Febr. 1995), 521 - 523. Navratil, L. 1978. Gespräche mit Schizophrenen. München. Peters, U. H.. 1973. Wortfeld-Störung und Satzfeld-Störung. In: Arch. psychiat. Nervenkr. 217, 1 - 10. Peters, U. H.. 1984. Sprachstörungen bei Schizophrenen. In: Bochnik, Richtberg (Hgs.). 1984. Sprache - Sprechen - Verstehen. Zur Phänomenologie und Praxis menschlicher Kommunikationsstörungen. Erlangen. 116 - 120. Peters, U. H.. 1991. Die Verwerfungen im Sprach- und Textverhalten Schizophrener. In: Kraus, A. / Mundt, Chr. (Hgs. ), Schizophrenie und Sprache. Stuttgart / New York. 8 - 21. Poljakov, J.. 1973. Schizophrenie und Erkenntnistätigkeit. Stuttgart. Schecker, M.. 1991. Sprachverarbeitung und Gesprächsverhalten bei Schizophrenie. Antrittsvorlesung Freiburg i.Br. .
Schecker, M. 1993. Zwischen Sprecherrekonstruktion und Hörerantizipation: Gestörtes Gesprächsverhalten bei Schizophrenie. In: Löffler, H. (Hg.). Dialoganalyse IV. Tübingen, 247 - 264. Schecker, M. (zusammen mit Baier, P., Fabry, G. und Schäuble, B.). 1998. Konkretismus, Kontext und Informationsverarbeitung bei Schizophrenie. In: Schecker, M. & Kindt, H. (Hg. 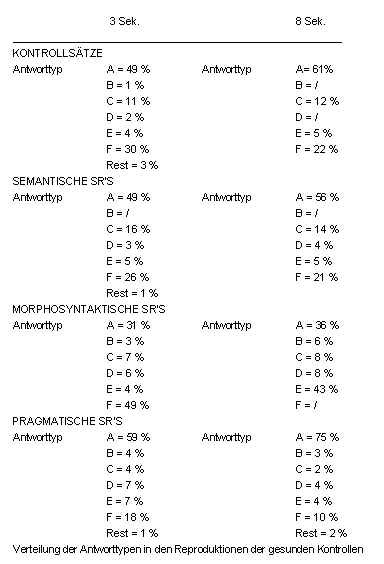 ): Sprache und Schizophrenie. Freiburg: HochschulVerlag. Schwarz, M.. 1992. Einführung in die kognitive Linguistik. Tübingen. Schwarz / Chur. 1993. Semantik. Tübingen. Spitzer, M. 1993. Assoziative Netzwerke, formale Denkstörungen und Schizophrenie. In: Der Nervenarzt 64, 147 - 159. Spitzer, M., Weisker, I., Winter, M. and Maier, S. 1993. Semantische Aktivierungsphänomene bei gesunden Probanden und schizophrenen Patienten: Analyse auf Wortpaarebene. In: Zeitschrift für Klinische Psychologie, Psychopathologie und Psychotherapie 41, 343 - 357. Spitzer, M., Weisker, I., Winter, M., Maier, S., Hermle, L. and Maher, B.A. 1994. Semantic and phonological priming in schizophrenia. In: Journal of abnormal psychology. Spitzer, M., Böhler, P., Kischka, U. and Weisbrod, M. 1994b. A neural network model of phantom limbs. In: Biological cybernetics. Spitzer, M. 1998. Cognitive Neuroscience - Zur Psychologie, Psychopathologie, Neuropsychologie, Neuroinformatik und Neurobiologie sprachabhängiger Denkprozesse. In: H. Kindt / M. Schecker (Hgs. ), Sprache und Schizophrenie, Freiburg (Hochschulverlag)..
Strube, G. 1984. Assoziation. Der Prozeß des Erinnerns und die Struktur des Gedächtnisses. Heidelberg. Swinney, D. 1984. Theoretical and methodological issues in cognitiv science: a psycholinguistic perspective. In: Kintsch, W. / Miller, J.R. / Polson, P.G. (Hgs.). Method and tacties in cognitive science. Hillsdale/N.J. .
Tress, W. and Pfaffenberger, U. 1991. Die sprachliche Verwendung des Begriffs "schizophren" - eine sprachphilosophische und linguistische Untersuchung. In: Kraus, A. / Mundt, Chr. (Hgs. ), Schizophrenie und Sprache. Stuttgart / New York. Urbach, Th., Krieger, St., Olbrich, H. & Schecker,M.. 1998. Selektionsrestriktionen und die Verarbeitung verbaler Kontexte bei Schizophrenie. In: Michael Schecker & Hildburg Kindt (Hg. ): Sprache und Schizophrenie. Freiburg: HochschulVerlag. Uchtomsky, A.A. 1966. The dominant. Moskau (auf Russisch; zitiert nach Zaimov 1981). Vaadia, E., Haaiman, I., Abeles, M., Bergman, H., Prut, Y., Slovin, H. and Aertsen, A. 1995. Dynamics of neuronal interactions in monkey cortex in relation to behavioural events. In: Nature Vol. 373 (9. Febr. 1995), 515 - 518. Wender, K. F.. 1988. Semantische Netzwerke als Bestandteil gedächtnispsychologischer Theorien, in: Mandl / Spada (Hgs.). 1988. Wissenspsychologie, München. Wildgen, W. 1985. Archetypensemantik. Tübingen.York, 38 - 52. Winer, B. J.. 1971. Statistical prinzipels in experimental design. New York. Zaimov, K. 1981. Associative processes in semantic jargon and in schizophrenic language. In: Brown, J.W. (Hg. ), Jargonaphasia. New York, 151 - 168. Zaimov, K. 1989. Analysis of thought dissociation in schizophrenia on the bases of Wedensky-Pavlow phasic states. In: Pavlovian journal of biological science 24/4, 138 - 142.